I’ve mentioned before that i have a special corner in my heart for the Balvenie, as it was the first single malt i fell in love with a few years ago. Since then I’ve taken a liking to peated malts, but i not only , as you might know by now. Imagine how thrilled I was upon hearing of this new 17 year old Peated Cask expression. Balvenie, with peat. Can it get any better? Before tasting this one I’ve read quite a few opinions and tasting notes by other bloggers and whisky ‘experts’, and not all were partial to this one. So, finally i got me a wee sample of this and set to make my own mind about it. 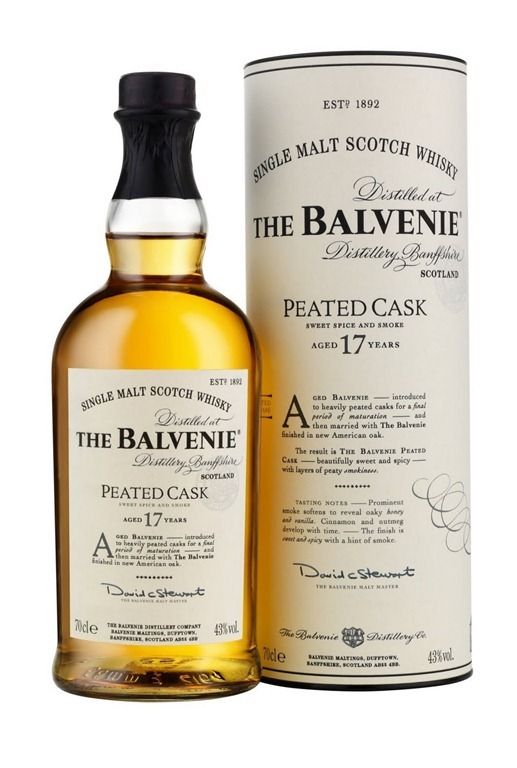 This 17-year-old is a product of a marriage of 17-year old Balvenie finished in new oak (Bourbon) and 17-year old finished in casks that had previously held an unreleased experimental heavily-peated Balvenie distilled in 2001. Very interesting stuff. Now, Shall we dram? Nose: I love this nose. is this a Balvenie? It starts with a nice Smokey aroma. Some kippers, some earthy musty peat, then the sweetness hits you. On top of all this peat floats a little malty sugary (burnt sugar kind of) sweetness. This is sheer beauty. On second whiff, a certain fruitiness (peach? apricot? ) appears to hover above the smoky fire, now gone. i could be sniffing this little wonder of a dram for hours. this is very interesting. Not medicinal at all. Palate: We start of with a sweet and malty feeling. creamy, Balvenie style. Some spicy peppery sort of feeling going on in my mouth as well, not spicy pepper, more like Smokey pepper. Butter, cream, oil. viscous stuff. some toffee, and the sugars are not missing. Finish: Medium, with some cocoa, citrus zest, spices and of course the wee pepper notes, ending on bitters. A very well made dram. the nose is a-m-a-z-i-n-g, i just love it, the palate is good, but not quite as the nose. All in all, one of the better Balvenies I’ve tried. Better get going and secure a bottle. not many are there for grabs! (7000 bottles i reckon). many thanks to Andrew of the Balvenie for the official sample, and to Mark for the additional sample.